Discover how you can start small with commercial real estate and work your way up into bigger and bigger deals. If you have limited capital, are risk averse, have very little experience or are intimidated by the big numbers of commercial property, consider starting small. You’ll also discover that small commercial deals can be extremely profitable and there are far more small commercial properties than large ones so you have more options and opportunities. You’ll also learn the natural progression of a successful commercial investor, the ladder of succes and many more details that will help you along your journey. 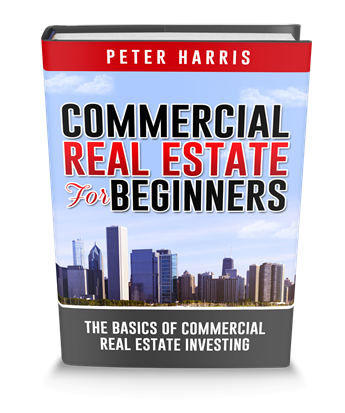 This is the perfect training for anyone who wants to get into commercial real estate investing but has been held back by fears and trepidation. 2nd. After the first deal stabilizes, you buy a small-to-medium deal. This is a natural progression that we call the ladder of success, in commercial real estate. What is a Small Commercial Real Estate Deal? A small commercial deal is defined by three definitions. Number one, a small commercial estate deal is an apartment building that’s between 5 and 20 units. An apartment building that consists of five units and greater, is considered commercial. Anything that’s four units and lower is considered residential. The second definition of a small commercial deal is a commercial building that goes up to about 3,000 square feet.? That could be an office condo, retail center, single-tenant commercial space, or any other commercial property as long as it is up to or around 3,000 square feet. Lastly, I would define it as a commercial building that you can envision yourself owning. Something that you can afford to buy in your current financial situation. Since small commercial deals have smaller numbers, they are easier to understand, and more affordable. In commercial real estate, you have to put a down payment down of around 25%, so that will be 25% of a smaller number, as opposed to a large deal, where there’s a large number. You’re more likely to do something creative with a smaller deal, because of the ownership. On a larger property, the ownership is more sophisticated but most smaller properties have smaller owners that are willing to do something creative like a master lease or seller carry second mortgage. There is also less risk with a smaller property, because if you make a mistake you will not lose out on as much money as you would a larger property. There are a lot more smaller properties available to buy than there are larger commercial properties. In the U.S. there are about 450,000 apartment buildings between the range of 5-20 units. From 20-100 units that number goes down to 95,000, apartments in the US. That is a 5/1 difference in large and smaller properties, which means there’s five times more smaller commercial real estate deals. The final reason why you should consider doing something small, is because it just makes sense to you. Wherever you are in life, it just makes sense for you to start with a smaller property. One of my students purchased a six-unit property with a current cashflow of $15,000 a year. After taking a look at some local rent surveys, we discovered that the rents could be bumped up if we painted and cleaned up the property. So my student fixed the property up, increased the rent, and cashflow increased to $24,000 a year. As the NOI goes up, cashflow and property value go up, so she sold the property after a year and made an $80,000 profit. Next she purchased another six unit next door to the property to repeat the entire process again. Her strategy is to buy, fix, and sell, so she can build up her capital base for larger property purchases. She is currently pursuing a 40 unit apartment building. I have a video on, “How Conventional Banks Work” for further information on this investment strategy. A Master Lease deal is one of my favorite techniques in creative real estate. I purchased a seven unit apartment with 15% down and a three year master lease agreement seller financing. It only took me a little over a year to get out of the master lease and qualify for a permanent loan. I held onto the apartment for 12 years and just sold it a few years ago. A student of mine who was a nurse, had zero experience in real estate, and limited funds. So we taught her how to find an off-market deal and at the same time, find a buyer. So she networked and got the off market deal, found a buyer, and flipped the contract to the buyer to make a $26,000 profit at closing. $26,000 just by flipping the contract to a buyer. Buying a distressed property is considered an oppurtunistic deal, and is not for everyone. It is an oppurtunity to make a decent amount of money on small properties. My student purchased a five-unit building that needed rehab, so he had to pay all-cash, which was $160,000. He did this because he saw potential in the property. At closing, he sold what the property could be to the bank , which resulted in them giving him $80,000 in the line of credit. The goal is to go through each of the units, fix them all up, let the property stabilize and it’ll be worth 320,000. Then, the goal is to do a cash-out refinance and pull out his entire capital that he spent. At the end of the day, because he’ll do a 75% cash-out refinance, so 75% of 320 is 240. In that sense, he’s gaining out everything that he put in. Now, some of you may be thinking, “Well, he’s over-leveraging.” He’s not. The bank will only allow him to pull out 75% of what it’s worth, to make sure it’s still a cash loan. I actually have a video called How to Buy Distressed Commercial Property, so check out the video. I’m going to share with you the natural progression of a typical commercial real estate investor, going from a small deal, all the way up to a holder of a large portfolio of commercial properties. This applies to you if you have a 9-5 job, if you have no experience, or if you’re starting off with very little money. This is the natural progression of success that we call the ladder of success. There are four phases, you’re going to go from a small deal, to a small-to-medium deal, to medium deal, to a large deal. After that, the sky is the limit. Purchase a small deal with a conventional bank to either wholesale or master lease. When you wholesale, it’s not ownership, it’s completing your first deal, whether it be something creative, wholesaling, or something conventional, through a bank loan.? A small deal, right? Once you’re done with this, you’re going to graduate to the small-to-medium phase. When you graduate to this deal, your credibility is going to be kicked up a notch, because you completed the small deal already. Commercial real estate is not the type of business where you’re going to get wealthy in six months. It’s what we call a L-O-N-G game. Once you complete phase 2 with a small-to-medium deal, you’re going to graduate to the medium-sized deal. This deal is going to have a definite financial impact on your life. You will see the light and the light will tell you, “Oh, I think I can do this and eventually leave my job.” Once you get your medium deal, you’re at a whole new level, a different language, and your mindset is different as well. Now you can see the potential of what real estate can do for you and your family and the options you have of working part-time, pursuing a passion of yours, or just leaving your job. Also, when you participate in large deals, you’re going to have to start doing this full-time, because if you have a 9-5 at this phase, it will start to get in the way of your real estate success. You’re going to have to leave your job. All right, so, small deal, small-to-medium deal, medium-sized deal and large deal. After this, there’s no limit, the sky is the limit of what you can do in your commercial real estate career. This is a natural progression of success that we use with our students in taking them from small deals, all the way up to becoming a holder of large commercial properties. Or Would Your Prefer B? A 12-unit apartment building, that you wholesale to earn a $40,000, one-time commission. So, A or B? That’s the question. If you prefer A, which is the $20,000-per-year in cashflow, you’re going to experience passive income, that you can use to build up your nest egg, retirement, or use it as is your 401K. Would you prefer that? Or would you prefer B, which is making a one-time lump sum fee of $40,000 by wholesaling a commercial deal that you filed. In this case, you’re going to receive a lump sum of cash, you can use it to pay off your student loans, or perhaps you’re going to do multiple wholesale deals to build up your capital base or your down payments so you can purchase your own property. What I want you to do now is, in the comment box, I want you to choose either A or B. Just put an A, if you’d prefer the $20,000 a year in cashflow, or the letter B, if you prefer the one-time lump sum fee of $40,000. Go ahead and do that, I would like to see your answers, because they will tell me a lot about where you are and what your goals should be. $20,000 a year cashflow. I’m 76 years old. I would prefer the capital so I can have some financial security to move forward; that way I would feel more secure to take that next step. Why? 1. Monthly income for peace of mind. 2. Makes it easier to work on the next deal. 4.Looks good to money lenders and finance companies. A. Looking at passive income for the end game. B-would like to have a lump sum to make more deals.